Last week was a busy week for me, but I tried to follow the SIHH 2009 releases of the watch manufacturers that were attending this early 2009 watch expo. Kyle and James over at Perpetuelle.com did a great job on publishing all the interesting horological novelties. Thanks guys! I was impressed by some time pieces, but also frowned my eyebrows a few times. One of the strangest creations came from Girard-Perregaux with their Rally “Monte Carlo 1983” watch (reference: 49930-11-651-BM6A). It just looks like the right side of the watch melted a bit when Girard-Perregaux created the watch. If you are a dedicated reader of this blog, you probably know that I have a weak spot for the Royal Oak series from Audemars Piguet. However, the Offshore models – with their rubber elements – are the ones that I am not particularly fond of. 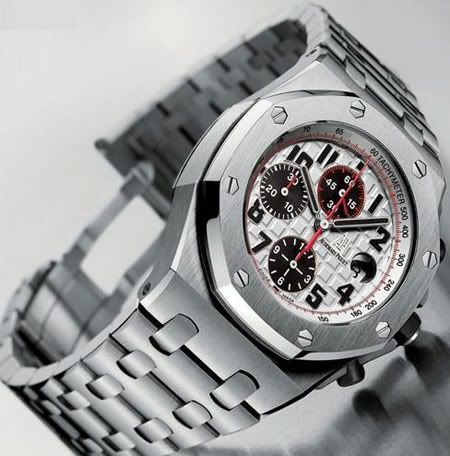 During the SIHH 2009, AP introduced a new Royal Oak Offshore Chronograph model with reference 26170ST.00.10000ST.01. I wonder how they came up with these ridiculously long reference numbers. I also like the fact that these watches are still wearable with respect to their size of 42mm. The [SIHH] introduced Ebel 1911 Tekton chronograph is also a watch that I really like (with their inhouse Ebel caliber 137 movement), but 48.5mm is beyond crossing the line of big. And having that said, I don’t want to comment on the 60mm watch that Panerai introduced during the SIHH 2009. The AP ROOS CHR (as I would like to abbreviate this watch) is water resistant to 100m, which seems a bit little, looking at all those rubber elements, thick casing etc. Anyhows, if it works under the shower, it works for me. 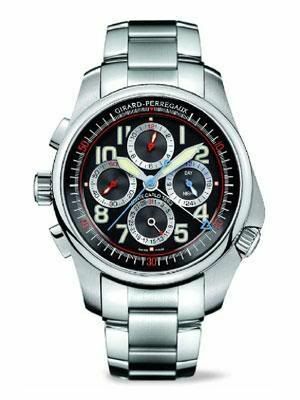 This watch has a power reserve of up to 60 hours. Last but not least, I was quite impressed by the Piaget Polo Tourbillon watch, with the sailing ships painted (enamel) on the sides of the case. However, I was very certain that I already had seen Piaget doing something similair before. After browsing in my magazines a bit, I noticed the Piaget Polo Tourbillon from last year, in a TimeWerke magazine. 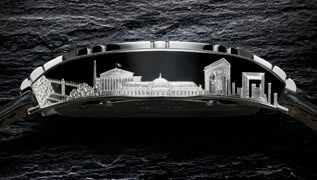 The Polo Relatif Paris-New York has city icons painted on the sides of the watch case. The SIHH 2009 is over now.. let’s head for Basel 2009. This year, I will be finally attending it, together with Frank @ Monochrome.